Why do the white lines crack on a tennis court? Question: Why do the white lines crack on a tennis court? Answer: This is basically created by the expansion and contraction of the asphalt at different rates. The white lines, with their bright color, exhibit high reflectivity of the sun’s rays. This results in cooler asphalt and minimal expansion under the lines. The adjacent playing surfaces have darker surface colors, which absorb more heat from the bright sun. In contrast, this tends to soften the asphalt binder and cause expansion. Over time, this back and forth movement can lead to cracks in the asphalt (which loses flexibility and becomes more brittle as it ages). 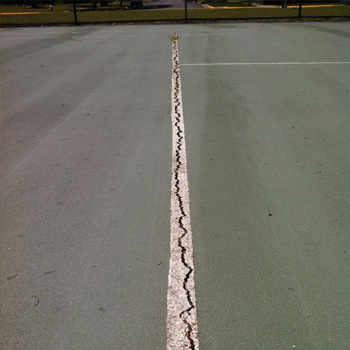 Once cracks open up in the asphalt tennis court surface, the exposed asphalt begins to shrink and water intrusion can exacerbate the problem and increase the size of the crack at a quicker rate. Water settles into the stone base and wreaks havoc, especially in “freeze-thaw” regions. The additional expansion and contraction in the base will speed up degradation and the cracks continue to grow. How can this problem be minimized? Lighter tennis court surface colors can minimize the effect so that there is not such a big temperature contrast from the white line to the surface. 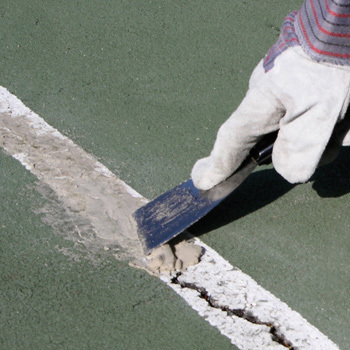 At minimum, make sure to keep the cracks sealed with an acrylic tennis court crack filler. This will help to maintain the crack and slow down the growth to provide better safety and aesthetics.